Azure, a phoenix reappearing Argent on a rough-hew allumee Gules and on the dexter is set in chief a sun in splendour Or; to the quarter of the barons mayors. Quarterly: to the 1st, of the counts senators, a bordure Vert; to the 2nd, Or plain; to the 3rd, Or, a fess checky Argent and Gules; to the 4th, Gules, 3 flowers of medlar trees Or 2 and 1. Gules, 3 flowers of neufliers Or, seeded of the field. Azure, a chevron Argent accompanied of three spearheads of the same; a bordure Or; to the quarter of the counts presidents of body of electors. 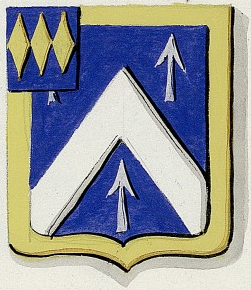 Azure, a chevron Argent, accompanied of three spearheads of the same; a bordure Or. 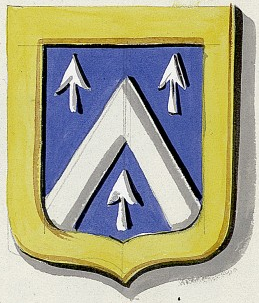 Azure, a chevron Argent, accompanied of three spearheads of the same. Transmission of the title and majorat of baron-peer conferred to Gabriel-Thomas-Marie d'ARJUZON, by letters patent by 2 February 1809 and 13 March 1820 (these last modifying the title of count in that of baron, for the plate of hereditary peerage), confirmed in favour of his/her son junior, Felix-Jean-François-Thomas, count of ARJUZON, by ministerial order of 6 December 1852. Transmission of the title of hereditary count and majorat to the title of baron-peer conferred to Gabriel-Thomas DARJUZON, by letters patent of 2 February 1809 and of 13 March 1820, confirmed in favour of the elder grandson in primogeniture, Georges-Jacques-Marie Of ARJUZON, by ministerial order of 3 April 1875. Azure, a dexter arm Or issuing of the sinister, holding a banner deployed also Or and accompanied of two palm leaves Argent; to the quarter of the military barons. Or, a fess Gules, charged of the mark of knights of the Legion of Honour, and accompanied in chief of a hunting horn Azure, traversed in fess by sword Gules, base in dexter, and in base of a fort Gules, supported and terrassed of the same, issuant of a river Vert. Ermine, 3 annulets Gules, intertwined in triangle, kittens hilted , the 1st, of the tiara, the 2nd, of the imperial coronet, and the 3rd, of a she-wolf. 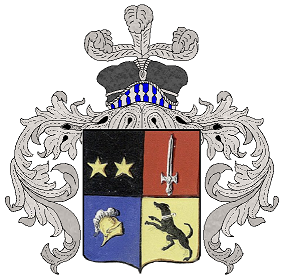 Quarterly : to the 1st, Sable, 2 mullets Or set in fess; to the 2nd, of the military barons; to the 3rd, Azure, a facing the sinister ancient helmet Or, shandy Argent; to the 4th, Or, a rampant greyhound Sable collared Argent. Azure, a chevron Argent accompanied in chief of two mullets, and in base of a tower, the whole of the same; to the terrace in base Gules charged of the mark of knights of the Legion of Honour. Azure, a castle Argent embattled and windows Sable, closed Gules, accompanied of two turrets also Argent, and supported of a terrace in base Sable, a fess Or debruising, surmounted of three annulets of the same; on the dexter is set of a third Gules charged of the mark of knights of the Legion of Honour. 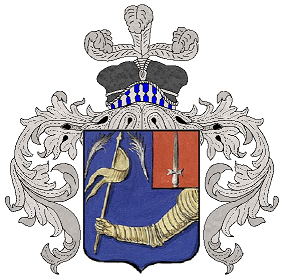 Tierced per fess: Azure, a lily erased Or; Sable, a bend Or; and Gules, a rose Argent; over all, Azure, a lion Or, armed and langued Gules; to the quarter of the barons of the body of electors. 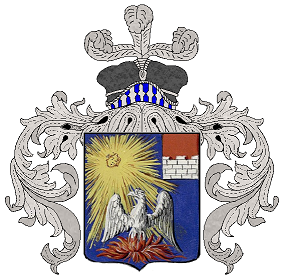 Per bend Azure on Gules, to a bend Or, fimbriated Sable, debruising on the per bend, accompanied in chief of a lys flower Or and, in base of a rose Argent, which is of ARNAUD OF the ROUSSET, and charged in middle fess point of an escutcheon Azure, to the lion Or, which is of ARNAUD OF VITROLLES.